Combat is an at home workout program designed after the popular Les Mills BODYCOMBAT classes you would find in your local gym. It is a mixed martial arts inspired program that uses aspects and movements from several different disciplines. It combines these moves, a lot of punching and kicking, with high-intensity cardio. I find the program to be very fun. The music is great, the instructors are motivational and do an excellent job of explaining the moves. With about 1 week left I have seen my balance, flexibility, and strength improve. I’ve also lost a few pounds and several inches. Overall, I love this program and will either be starting round 2 when I’m finished or doing a hybrid with Les Mills Pump. I feel that this can be a great beginner program. They do a great job of modifying the moves to help you ease into the workout. The program also comes with a “basics” dvd that walk you through the basic moves and explains the key things to focus on when doing them. 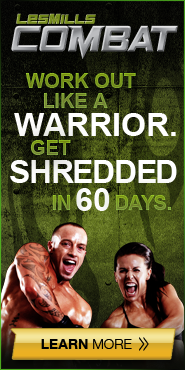 I also think it is a great program for those that are already in good shape. It’s easy to up the intensity and the program is designed to keep it challenging for anyone. If you have any questions about this program or any others please don’t hesitate to ask. Beachbody has great programs for every goal. Let me help you find one to fit your needs and goals. Have Fitness Questions? I Can Help! One of my goals for this website is to answer any questions you might have about health, fitness, and nutrition. So I would love to hear your questions and/or suggestions for posts. Do you have specific questions about working out or how to properly do a certain exercise? Do you have a topic that you would like to see me cover in an upcoming post? I would love to hear from you so if you have any questions at all please don’t hesitate to comment on a post or email me directly with your questions at jen at gettingfitwithjen dot com. I will do my best to answer any and all questions. Squats: This move primarily works the muscles of your upper legs. Quadriceps, hamstrings, and glutes. Here is the first of hopefully many videos to come that will show you the proper form and technique of different exercises. My plan is to create an entire library for you. The goal of these videos is to help answer any questions you might have as well as give you some options if you are looking for a new exercise to try. Bicep Curls: The basic bicep curl primarily works the muscles on the front of the upper arm (biceps). How Can You Stay Accountable to Your Workout Program? Over the years I have found that the only way I will stick with a workout program is to find different ways to keep myself accountable. If I don’t have that accountability, I tend to do well for a week or two - (I once set a record at almost two months!) - before I fall off and stop being consistent with my program. The best thing that I have found to keep myself accountable is to have a workout partner. When I know that my workout buddy is counting on me, it becomes a lot harder to skip a workout. We can also be there for each other to encourage the other when one of us doesn’t really feel like working out. This doesn’t mean you have to workout together necessarily. You can have a workout partner that lives in a different town. The two of you would figure out your program and check in with each other daily or weekly to make sure that workouts are getting done. Write your goals and daily workouts down. By simply writing your goals down, you are more likely to follow through with the needed work to reach those goals. Also, when you track your daily progress it keeps you focused on your long term goal. Another easy way to “write down” your daily progress is to post it to Facebook. Through social networking you can stay accountable and gain motivation. You may even motivate someone else to start their own fitness journey! Schedule your workouts just like you would any other appointment. Planning a specific time every day to workout will help you stay accountable. This doesn’t mean that you can’t be flexible if something comes up. But when your workout is scheduled into your day, it is a lot easier to fit it in. Accountability is huge when it comes to sticking with a workout program. Finding something that works for you is a must! What have you found that helps you stay accountable to your workout program? I recently went on a week long, wonderful vacation with my family to Branson, MO. We stayed at a beautiful place right on a lake. Even though I was on vacation, my workout buddy wasn’t with me, and I didn’t have my weights, I still wanted to continue to workout. Therefore, I had to be creative and find things I could do while I was there with my family. View from our condo. Absolutely beautiful! I had planned on taking my resistance bands since those pack easily. But would you believe, once we arrived I realized that I’d forgotten to pack them! I guess next time I should remember to look at my list when I am packing. Since I didn’t have weights or resistance bands, I just had to be a little more creative in order to get some resistance training in. Therefore, I did pushups, tricep dips, crunches, and took the stairs any time there was an option. In addition, my aunt and I decided that we would go for walks in the mornings. Great idea! One problem though: There was a huge hill that we would have to walk up if we were going to go very far. We decided that we were up for the challenge. Our walks started off at a really good pace, but then we hit the hill. Our conversation stopped and it was all we could do to make it up the hill. Talk about a killer cardio and strength workout wrapped up in one thing. My calves were on fire! From the top of the hill looking down. Coming down this hill was easier on the lungs than going up, but just trying to keep our bodies under control so that we didn’t have to break out into a run was tough. I wish you could see this hill in person. The pictures just don’t quite show you how steep and big it was. You can’t even see the top when you are starting up it. It’s crazy. What a great way to get to spend some time with my aunt and get a good workout in while I was on vacation. We had some great conversations while on our walks, except for when we were going up that crazy hill, of course. Vacations can bring a much needed break from your exercise routine, but you can also keep up with some workouts if you want. You may need to make some adjustments but it’s definitely doable. If you would like some other ideas, you’ll be interested to read these tips on How To Stay Fit While On Vacation. What other things have you found that you can do while on vacation to stay with your workout routine? When it Comes to Nutrition, Should You Count Calories? While eating a good, healthy, balanced diet, focusing on the number of calories we are consuming may not be nearly as important as some may tell us that it is, as long as we are not over-eating. When we feed our bodies with proper nutrition, our bodies are able to use that food to make fuel so that our bodies can function efficiently. When we eat a lot of processed junk food, our bodies don’t know what to do with that, and therefore has a much harder time making the needed fuel. Therefore, that “junk” ends up being stored as fat, because our bodies don’t know what else to do with it. Listen to your body. What food does it seem to be asking for? Are you full? Stop eating. Are you feeling dizzy? You may need protein. Are you feeling depressed? You may need to be eating more healthy fat, or you may need to cut out extra sugar. Are you feeling low on energy? You may need a healthy carbohydrate. And always, always focus on eating lots of fruits and vegetables. My experience has been that since I’ve started focusing on good nutrition and exercise instead of calorie counting, I’ve seen many changes in how I feel. When I listen to my body and eat a well balanced diet of real foods, I find that I feel great, and have the energy I need to work out. I also notice how I feel when I don’t eat healthy! While focusing on a real foods, well balanced diet, you may find that you are able to drop a few pounds without counting a single calorie. Looking to begin an exercise program, tailor made for you, while you work to eat a healthy diet? I’d be happy to help you get into great shape! Read more about the services I offer here. Shakeology – The Healthiest Meal of the Day! Would you like a meal replacement shake that tastes great, can help you lose weight, feel energized, improve digestion, and lower your cholesterol? Well then you might want to consider Shakeology. I started drinking Shakeology a little over a year ago, and I can definitely say that it has helped in all the ways it claimed that it would. I personally love to mix the chocolate variety with some milk and a little bit of natural peanut butter. There are also other great recipes out there for you to try and I will share those at a later date. So why not give the healthiest meal of the day a try? What an easy way to start your journey to healthier eating by replacing one meal a day or using it for a healthy snack. This might be one of the biggest motivators that has helped me stick with my exercise routines. If I know my friends are counting on me doing a workout with them, it is a lot harder to skip out. I also have a free online account through Beachbody that allows me to schedule and log my workouts. Accountability is huge! Try to find someone or something to hold you accountable to your workout program. 2. Find a program that works for you. I’ve started several programs that I’ve found to be too advanced. Well guess what? It wasn’t long before I quit those programs, once again getting out of a good workout routine. However, once I found a program that fit my current needs, it was a lot easier to stick with. I would be happy to help you figure out a program that will be just right for you. 3. Keep variety in your programs. I think I have “Exercise ADD”! I have to constantly be changing things up, or I simply get bored with my workout. I’ve learned that if I am sure to have a variety of workout options to choose from, I am much more likely to stick with a program. 4. Don’t get frustrated if you can’t do everything perfectly. I’ve gone through several programs in which I’ve struggled just to complete the workout or to complete certain exercises during the first few weeks. But by sticking with it, I found that those elements I struggled with did get easier. I didn’t always master them, but I did get better and saw improvements. It’s not always about how well you are doing an exercise, but that you are simply doing something. Do the best you can and don’t worry about the rest. 5. Use the workouts to relieve stress rather then letting them cause stress. Exercise is a great stress reliever if you let it be. If you are too worried about the exercise, it can create more stress. For example, if something comes up and you simply can’t get a workout in one day, don’t worry about it. Just pick up where you left off the next day or as soon as you can! I hope that these 5 ideas will help you stick with your workout program. What else do you do to help you stick to a workout program?